ray keene: i believe nigel short also picked up the Queens jubilee prize of five thousand pounds for top commonwealth player so he made �25k and Hou took around �23k since she also got junior and gradings prizes i think.In any case Nigel emerged with a higher slice of the pot then Hou did. She didn't. "Common" prizes cannot be summed with any "special" prizes except for the women's one, see the prize table at the official site. As for one player - one prize, I find it ridiculous. I mean it would be ridiculous if the <second-best player> in his category gets a category prize because the best one won a "common" prize. Being called best while being second-best? Is the best one not a woman/junior/whatever else? I completely agree, Hou Yifan deserved the first prize because her performance in classical chess was much more impressive than Short's. To decide 10 rounds of hard fought classical chess matches with 2 blitz games is as dumb as anything I've seen in chess recently. Feb-03-12 virginmind: congratulations to nigel short and especially to hou yifan! Feb-03-12 Agent Bouncy: What's the obsession with tiebreaks anyway? If players finish with the same score just call it a tie. There is then no controversy about absurd or unfair tiebreak methods. The exception is in elimination events where a player must advance to meet the next opponent -- there does have to be a tiebreak provision in those cases. Otherwise, let them stay tied! Feb-03-12 Shams: <Agent Bouncy> In principle I agree with you, though I confess to a persistent infatuation with Most Wins. s4life, same question to you as to strongest force. where did you post your grievance with the above when <nakamura> won 1) gibraltar 2008 and 2) san sebastian 2009 due to winning 2 game blitz play-offs against bu and ponomariov - after having had the inferior sonneborn-berger tie-break from the main, classical event? If you win a tiebreak with most wins, it also means you had more losses. Reckless play tends to be rewarded. alexmagnus: In the Swiss system, performace is the most reasonable tie-breaker. and in 2008 in gibraltar (a swiss), bu's performance (tpr 2835) was nearly hundred points above that of nakamura (tpr 2744). san sebastian 2009 was a round robin. Feb-03-12 Shams: <Agent Bouncy> Yes, I make no claim that it is a better system. Draws are so much a part of our sport compared to most any other, that it seems fitting to award co-champions of tournaments, I'm with you. hm... what about when the difference in performance 91 points instead of only 41 points then? i guess s4life must have considered it <very> unfair that naka got the 1st prize back in 2008. <Five wins in the final five rounds, then 2-0 in the playoff (against Bu Xiangxi, a very strong GM) - a seven game streak to end the tournament. no bias here, of course. I had no complaints about the format. Perhaps you're arguing with a straw man, or somebody else here? Feb-03-12 JamTin: Completely disagree with the concept that TPR should be used as a tie breaker rather than tie break games. Ratings should have no place in attributing the result IMO. Fact is having played 10 games Short and Hou had the same scores. Hou had played a slightly stronger field, so what?! You can only play what's in front of you. I'd far rather the prizes were awarded on matches played rather than ratings, even if those tie break matches are blitz. But who you play depends on your results. After all, first round is seeded entirely by ratings - and thereafter the seeding position also contributes to your opponent (as well as points scored, where stronger players tend to come up with more :)). I don't remember the tiebreaks with Ponomariov but I remember the one Bu Xiang Zhi lost .. I thought it was a travesty at the time, I might not have posted then as I don't post often anyway... but it was equally absurd then as it is now. I'm guessing she probably doesn't focus on blitz nearly as much as her classical game....Unless she plays on ICC or playchess under an anonymous handle? People travel from all over the world for these tournaments, so there should be good prizes for most. The organisers have done a fantastic job to make it one of the worlds premier opens. Feb-03-12 Riverbeast: I would like to play in this thing! Feb-03-12 waustad: <ezzy> Short also won the Commonwealth prize, so he won the most. Feb-04-12 LIFE Master AJ: Short wins! Yea. 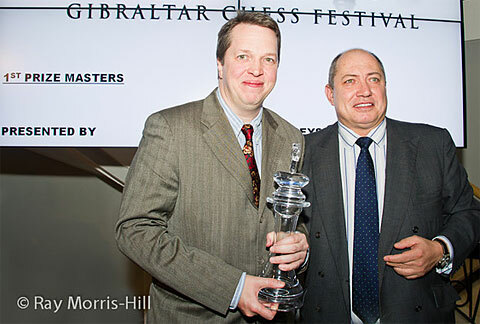 Nigel with the Gibralter Masters Trophy. Feb-05-12 LIFE Master AJ: Yifan Hou ... not quite ready to take on the world, not just yet.